With thy Needle & Thread: Watching Grass Grow??? I hope your "gunk" goes down soon...I love this beautiful kitty...he's such a pretty boy. Agassi is absolutely adorable watching his grass grow :-). I was wondering about this grass--when my cat eats the grass outside she throws up but I assume this is easier on their tummies! Beautiful kitty! Mine could use some of lessons on good manners from him. Stop it! with the creamy chicken soup! That sounds Devine. 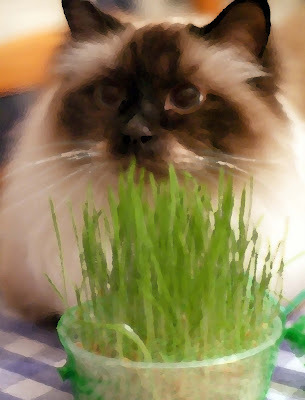 I may have to try kitty grass for my little Chewy, I bet she would like it. What a big beautiful blue eyed boy he is. I have a tiny little siamese named Sopie. She brings me joy and laughter with her antics on a daily basis. A good day to you and God Bless.